I grew up being dragged to flea markets around greater Los Angeles–and though I have fond memories of the Rose Bowl and Long Beach fleas, I think I remember them best for the soft pretzels and license to drink soda before noon. 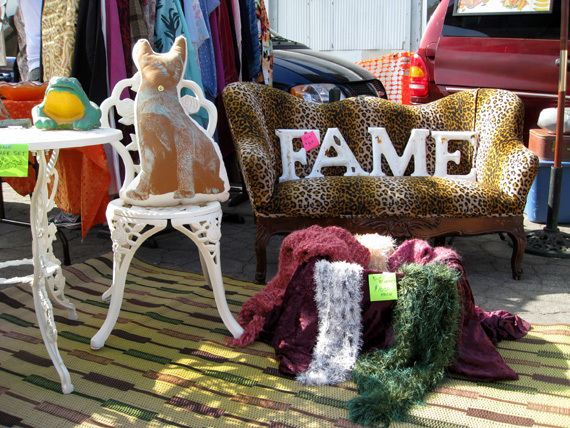 Last weekend I flew home and in my quick three-day trip, I was determined to give the L.A. flea market scene another shot. Because it was the fourth Sunday of the month, it was Santa Monica Airport’s turn in the monthly market cycle, and I couldn’t have been happier about the timing. Smaller and much better curated than the average show, it was the best way imaginable to spend the two hours before a flight. An airport parking lot doesn’t sound like a particularly scenic venue for a day of shopping, but the 175 vendors took the time to set up professional-looking displays (and the sea of prop planes in the background actually added to the appeal). Under white tents, vignettes of living areas and dining scenes made each set-up feel more like a boutique than a one-day booth. Part of the reason the displays worked so well is that a crop of contemporary vendors are also allowed to show there each month. 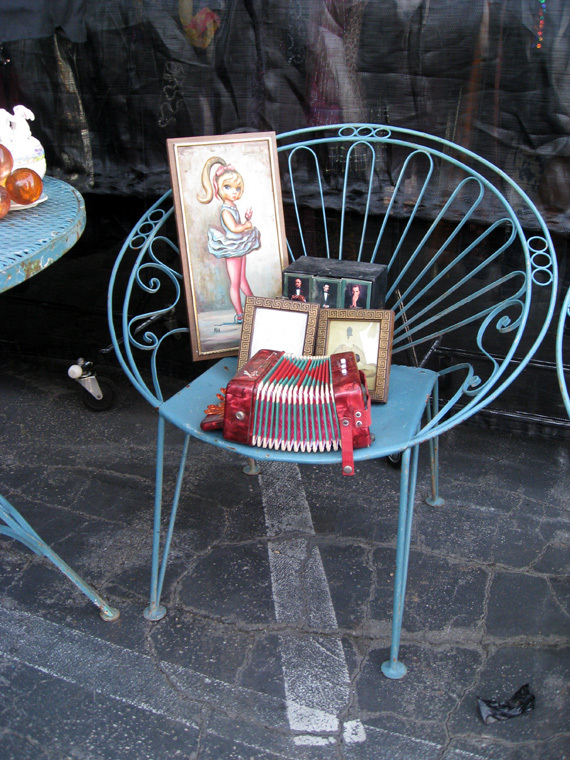 Though new wares generally send a flea market into swap-meet territory, these stalls with their shabby chic furniture, vintage accents and their slashed prices, actually blended nicely. 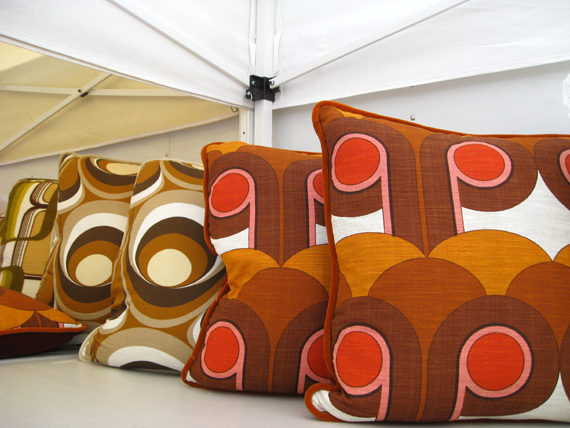 The Euro-Linen booth is the perfect example of the blend of old and new at this flea market. These pillows are made from vintage curtains and the rest of textiles in his booth are constructed from antique French ticking, grain sacks and cloth books. How Patricia Urquiola are these vintage chairs? If I had a patio in L.A., I would have purchased all six! 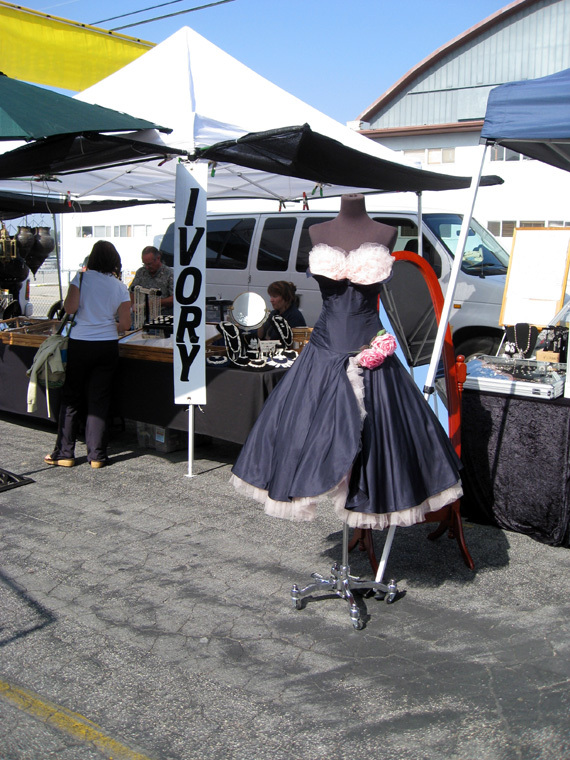 The Santa Monica Airport flea is much more about furniture and decor than clothing, but this dress was a knockout. 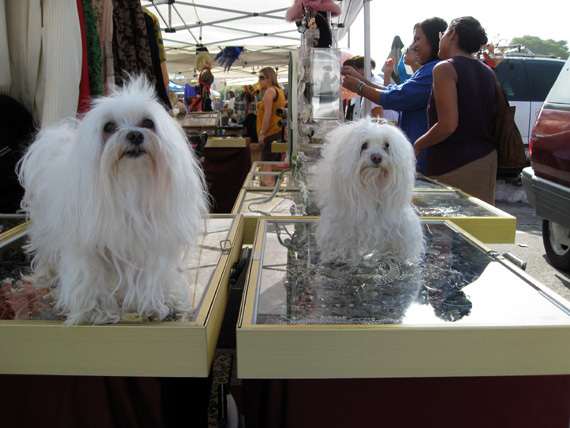 And I couldn't resist these fluffy five-pound dogs protecting their owner's jewelry. 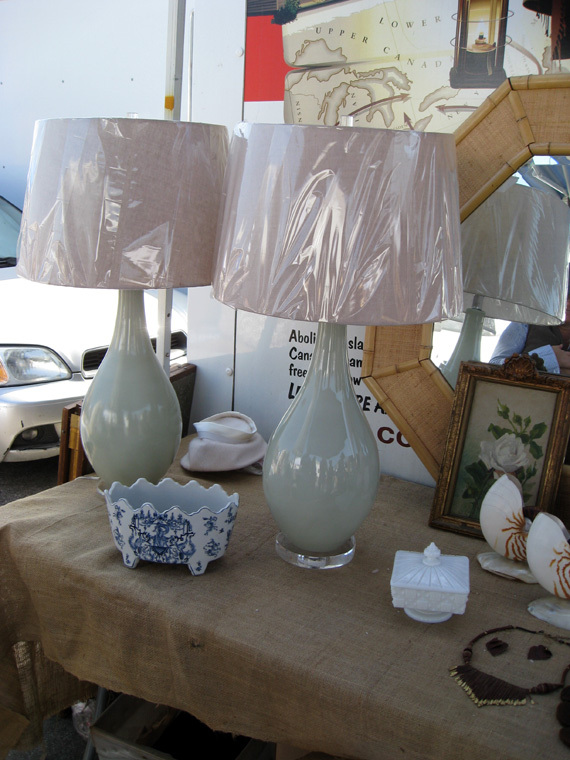 I fell in love with Cindy Ciskowski's lamps about four years ago, so when I saw a booth of her discounted items, I was ecstatic. My sister bought these two lamps for a mere $200. Love the Lucite bases. 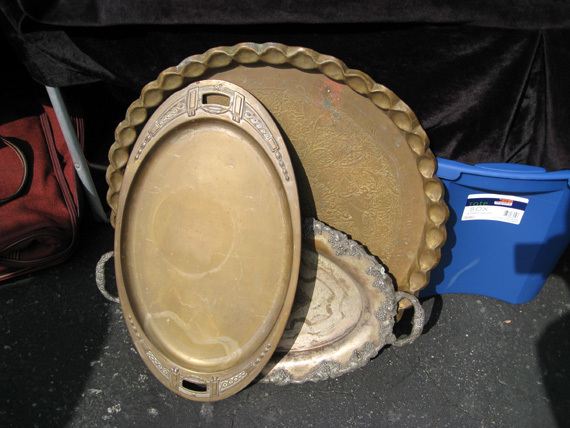 I got this oval art-deco tray as a backing for my next sconce project. Though I may feel different about the flea markets of my youth now, I am going to rank the Santa Monica Airport as one of the best–even the food was good! Santa Monica Airport Outdoor Antique and Collectible Market is open on the first Sunday from 8:00 A.M. to 3:00 P.M. and the fourth Sunday of the month from 6:00 A.M. to 3:00 P.M. (the fourth Sunday, the one I attended, is the bigger of the two and I highly recommend it! ).